Presented by the Office of Sustainability, in collaboration with: ASI Sustainability Affairs; RAW; Parking & Alternative Transportation Services; Student Life; H.O.P.E. ; DISC; Urban Dance Club; Student Housing & Residence Life; Concord Campus; StopWaste Alameda County; CivicCorps; and the City of Hayward. Food scraps that are still nutritious and can be included in dishes! The Lunch ’n Learn provides a visual and educational experience of reusing food scraps into sustainable recipes. The first half of the workshop is a no-bake demonstration and the second half will be a food waste and compost workshop given by StopWaste Alameda County. Corrina Gould is the spokesperson for the Confederated Villages of Lisjan/Ohlone. She was born and raised in Oakland, CA, the territory of Huichuin. She is an activist that has worked on preserving and protecting the ancient burial sites of her ancestors in the Bay Area for decades. She is the Co-founder and a Lead Organizer for Indian People Organizing for Change, a small Native-run grassroots organization and co-founder of the Sogorea Te Land Trust, an urban Indigenous women’s community organization working to return the land to Indigenous stewardship in San Francisco’s East Bay. Join the groundbreaking ceremony for the new CORE Building at CSUEB. Drop off old, broken, and unwanted electronics for free. Visit civicorpsrecycling.org for a full list of acceptable items. Personal items only! For University tagged e-waste, contact Lisa Booker. Come listen to tunes, enjoy some food, play games and explore the ways our local businesses, county services, and environmental groups are helping our home planet. Learn about the H.O.P.E. Food Pantry program at CSUEB and sign up for CalFresh. This workshop will discuss the ways in which environmental hazards are purposely placed around or near underserved communities. 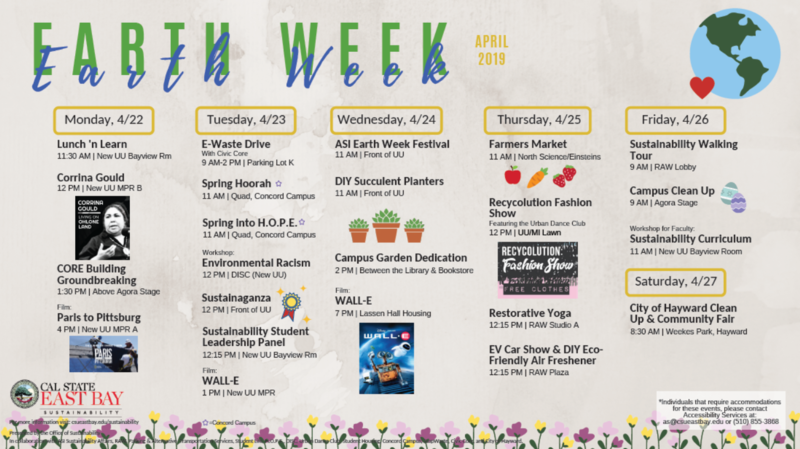 Tabling event featuring several departments and organizations from on- and off-campus with an emphasis on sustainability and environmentally-related resources. Check out the different programs represented and earn prizes along the way! What does being a Sustainable Leader look like? Attend this panel to ask questions and listen to your fellow peers talk about their experiences in sustainability and how you can be a sustainable leader. WALL-E spends his days tidying up the planet, one piece of garbage at a time. But during 700 years, he has developed a personality, and he's more than a little lonely. After meeting EVE, WALL-E embarks on his greatest adventure yet when he follows her across the galaxy. Celebrate sustainability and Mother Earth! Tabling event with music, food, and giveaways. Pot your own succulent to take home and watch it grow! Dedication to the creation of the Sustainability garden, filled with succulents and more. Hosted by ASI. The Farmers Market is an opportunity for students to purchase affordable, fresh fruits and vegetables. Come for free samples and recipes, learn about healthy options, play games, DIY crafts, and sign up for the CalFresh food assistance program. Cash, Visa, MasterCard, and Farmer Dollars are accepted. Open to students, staff, and faculty. Enter the drawing for a free basket of produce! Fashion show in partnership with Pioneers for H.O.P.E, raising awareness on the impacts of fast fashion, conscious consumerism, and resources for clothing needs. Get free clothes and check out a performance by the Urban Dance Club! Find a center in your mind and body. Experience deep stretches, controlled movements, and an opportunity to connect within yourself. The Eco Car show will feature several models of eco-friendly cars during Cal State East Bay's very own Eco Car Show. Tables at the event will highlight alternative transportation options to and from Cal State East Bay, limited swag! Make your very own earth-friendly air fresheners. Naturally scent your home, dorm, car, or anything else you may want to improve the air with. Get some fresh air! Join in for a campus walking tour and learn how East Bay is working towards a more sustainable future. Coffee and donuts provided. Help beautify the campus in an Easter Egg Hunt themed clean up! This workshop will address how to integrate the social, economic, and environmental components of sustainability and global learning into any course, regardless of discipline. Part of the Faculty High Impact Practices (HIPs) Certificate Program, this workshop is reserved for Faculty. The Annual Citywide Clean-Up is a litter pick-up event hosted at Weekes Park. Volunteers come together to collect litter and abandoned debris in various neighborhoods throughout the City. Bring a pair of gloves, meet new friends, and get involved!